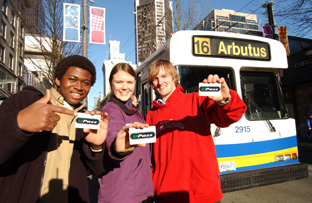 BC post-secondary students are going to have to wait a little bit longer to get their U-Passes. Post-secondary institutions and student associations are continuing their negotiations with TransLink and the provincial government, but the deadline has now passed to have the passes available for January. Once the details of the contract have been finalized, students at each post-secondary institution, including Douglas, will have an opportunity to vote in a referendum on whether they want to enter the U-Pass program. Jensen says that getting the contract right is essential to ensure that as many students as possible are eligible for the program. He also wants to make sure that students can vote for something that they feel is fair and equitable. Jensen says he’s confident that negotiations will soon be resolved and the U-Pass program will be available for a student referendum soon. If the referendums are successful, U-Passes will then be available for students in the spring of 2011. 40 after 40: Mahshid G. and Hooman S.